A recently completed 2 story extension presented an opportunity to have mezzanine floor for these clients. 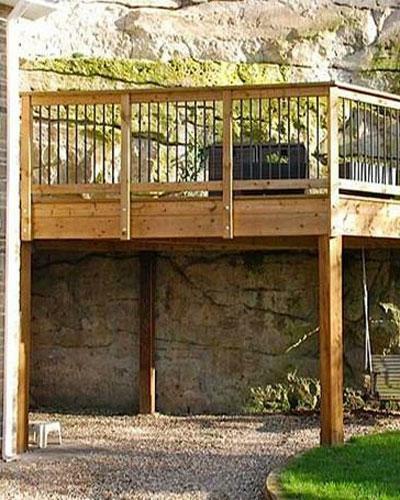 We were briefed to create a balcony style deck to be fitted tight to the cliff face and provide a useable entertainment area over the drive, still allowing a car to be parked underneath. Our clients instructed us to design a scheme that was chunky without being overbearing. We used pre treated softwood decking for this scheme, over a structurally graded pre treated timber substrate. We used a 9" x 3" heavy duty purlin frame to support a 6" x 2" joist frame. This removed the necessity for central support posts and satisfied our clients desire to use the space beneath to park a car. The use of powder coated aluminium spindles in the hand rails maintained a modern feel, in keeping with the recently completed building works. All works were completed were on time, on budget and without any additional costs.